+ Host at home. Assuming your house/apartment/living space can accommodate the number of guests you're expecting, try hosting the party at home. Renting a space or going to a restaurant does take some of the pressure off (hello, no cleaning!) but it will almost surely cost you a pretty penny. + Allow guests to bring a dish or drink. Many people offer to bring something to a holiday get together, and they truly mean it. Allow guests to bring one dish or drink -- maybe an appetizer, cheese and crackers, a bottle of wine, chocolate chip cookies. + Use wrapping paper as decor. This is one of my favorite tried and true tricks! There are so many great wrapping paper prints out there and it goes far. Grab a festive roll at HomeGoods or Target for a few bucks at most and use it for back drops, disposable table runners, or lay it on the counter under the food spread to make clean up super easy. + Don't rule out the dollar store. You guys. The dollar store is a goldmine for party goods. Plates, cups, napkins, decor, and don't even get me started on their gift bag selection. You can do so much with so little by gathering up a bunch of goodies at the dollar store. Think about it: If you have 12 guests, you can even get 12 frames for max $12 to frame name cards for the table. Grab a tube of ornaments for $1 and spread them across your table runner for instant festive decor. + Go light on decor. 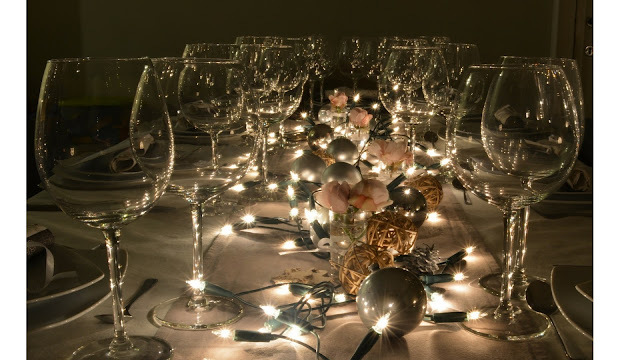 The nice thing about hosting a party around the holidays is the decor is usually built in: the glow of some strands of lights, a Christmas tree, candles, greenery... they double as simple, perfect party decor. 1. If you're a shoe-free house, let your guests know beforehand and consider even calling on people to wear their most festive socks! 3. This is probably an obvious one, but truly schedule your morning/day out before your guests arrive. Make sure you plan enough time to get ready -- shower, hair, get dressed -- not too early and not too late. There's nothing worse than rushing through getting ready upstairs while your guests arrive. These are great tips and some that I will use this holiday season. So glad they’re helpful! Hope your week is going well!